This is beautiful and perfect with that precious little fur baby! Thanks for joining the hop and helping to surprise Lesley! I love this image for a baby card, so precious! 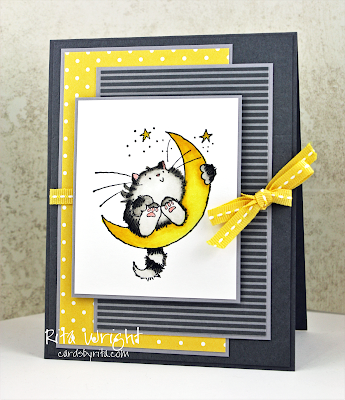 I love the non-traditional colour scheme you've chosen for your beautiful card, Rita! Wow! I love this card! All those layers make me want to case it! The colors and image are perfect!! Great card! This is a super cute card Rita! I am loving this bright yellow! EVERY card needs a kitty! I LOVE this design and I love the pretty yellow and black combination! Adorable! Thanks my friend! I love the non-traditional colours and that adorable image! Hugs!